I had always had an interest in names. What is it, who wears it, and especially what it means to the bearer. Most people I meet inherited their names from family long past. Some names are chosen without much creativity. Some are way too creative. Some people wear their names for the sound. Our own names are something we say with great consciousness. Like other Navajo kids, I grew hearing the admonition, “Don’t say your name. Your ears will dry up.” I had to learn how to introduce myself by my name later in life, when I felt I was strong enough to carry the name of my entire community. Uttering one’s own name, especially one’s original name, is like releasing breaths of prayers into the universe. Names are powerful among my people and connect you to your ancestors. Names carry you through life, empowering you with story and spiritual recognition. My father’s name was Mailboy. Named for his father’s trade, he was the son of a medicine man and mail carrier who rode horseback over the Chuskas. 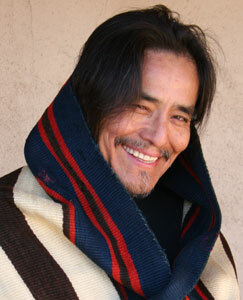 His surname, Begay, or son of, usually fills an entire page of Northern Arizona phone books. I am regularly asked where my name originates, and I never tire of the explanation. It was the responsibility of my eldest maternal aunt to place a name on me. In homage to my great, great grandmother who carried the name Asdzaa’ Shaa’n toh’, meaning Lady of Sun Water, she named me Shonto. It actually means: The glittery surface upon the water that reflects its light back upon the wall of the canyon, dancing and shimmering. My great, great grandmother farmed in such a place for many decades. For a while I lost the name. At first, I wasn’t called Shonto because I was given a second name by my eldest aunt to be used during the course of the day: Aashkii’ Yazhi, simply Little Boy. It had been customary to be granted a nickname, but I wish my aunt had the foresight not to stick with me something to make me feel slight. She could have chosen Boy with Wildfaced Horse, Collector of Ancient Story Rocks or maybe, Boy with Bright Dreams. Little did I know, my name would soon be taken, and so was I, from my sheepcamp home. When I went to live at a Bureau of Indian Affairs boarding school, I was given the name Wilson. They changed our names to control us. To make us obey, they grabbed our names like they yanked our long locks of hair—dubbed the B.I.A. handle—dangling above our foreheads. Wilson was the name I never got used to hearing. It was just the sound I answered to. It was difficult to write and even more difficult for me to pronounce. It was hard to be cool and adventurous with a name like Wilson. The name did not fit with my eyes as they charted my future. When I did visit home, my elders always called out Willi-Sin! to get my attention. The name hung there in the dry air like an unfamiliar relative. It did not shout out to the bullies that I was the son of a great medicine man. Like our umbilical cords, our names tie us to our place. Shonto, the place of my birth, is a place of soaring sandstone walls above my grandmother’s orchard—my home and my name. It’s a place where you go to hear the laughter of children and the songs of elders. Between school years, I spent my summers in the sheepcamp. Over time, I grew back into Shonto. For me, Shonto is a place where I celebrate my origin, and that of my young community members. I am in my element in Shonto Canyon. As part of the continuing ceremony of Beauty Way, join me at the Rock the Canyon festival from 9 a.m. to midnight Sat, Sept. 5, 2009, at the bottom of Shonto Canyon, beneath the stout oak trees near the original trading post. The celebration is free. The canyon will echo with song, laughter and color, and be fragrant with the aroma of fry bread. Join us for music, including the Hopi Clansman, art, poetry, comedy, performance artists, food and a farmer’s market. Our ancestors will be present in the celebration.